SNHR has released its annual special report for the year 2018 which was entitled: “The Crushing of the Society and Dismantling of the State”. The report documents the most notable violations of human rights by the main parties to the conflict in Syria during the last year. The 80-page report contains a record of the major events that took place in Syria in 2018, and sheds light on the most significant political and military developments that occurred on the Syrian scene in 2018. In addition, the report details the most notable local agreements that resulted in the displacement of hundreds of thousands of residents from their cities, towns and villages. The report, also, includes annual comparisons between the most notable patterns of human rights violations for 2017 and 2018. In addition, the report evaluates the fallout from the conflict with regard to the distribution of areas of control in 2018, which saw a significant expansion of the territories controlled by the Syrian-Russian-Iranian alliance forces at the expense of factions of the Armed Opposition. The report notes that the SNHR issued nearly 137 reports throughout 2018 concerning several types of the most significant human rights violations, which contained nearly 310 first-person accounts from those injured in attacks and other survivors, paramedics, and “central signal” operators, all of which were collected through speaking directly with eyewitnesses, rather than being cited from any open sources. According to SNHR’s database, 6,964 civilians, including 1,436 children and 923 women (adult female), were documented as being killed at the hands of the parties to the conflict in 2018. Of this total, 4,162 civilians, including 713 children and 562 women, were killed by Syrian regime forces, and 467 civilians, including 169 children and 51 women, were killed by Russian forces. 2018 saw also the death of 417 civilians, including 175 children and 90 women at the hands of International Coalition forces. Further, the report records that Kurdish Self-Management forces killed 285 civilians, including 29 children and 26 women, while extremist Islamist groups killed 478 civilians; of this total, ISIS killed 446 civilians, including 82 children and 41 women, while 32 civilians, including seven children and one woman, were killed by Hay’at Tahrir al Sham. The report documents that factions of the Armed Opposition, in 2018, killed 84 civilians, including 14 children and seven women, all of whom were either killed by executions, indiscriminate shelling, or torture. Lastly, the report records that 1,107 civilians were killed in attacks whose perpetrators could not yet be identified, or in attacks by border guards affiliated with neighboring countries – Lebanon, Jordan, and Turkey. According to the report, 2018 saw approximately 7,706 cases of arbitrary arrest, including 504 children and 699 women (adult female). The Syrian Regime was responsible for the arrest of nearly 5,607 of these individuals, including 355 children and 596 women. 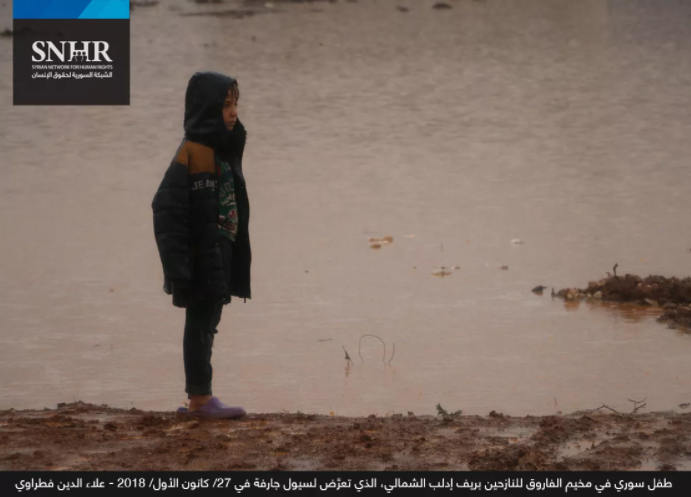 Extremist Islamist groups arrested at least 755 individuals, divided into 338 arrested by ISIS, including 28 children and 13 women, and 417 individuals were arrested by Hay’at Tahrir al Sham, including 15 children and three women. The total number of detainees arrested and imprisoned by factions of the Armed Opposition was nearly 379 individuals, including 23 children and 13 women, while Kurdish Self-Management forces arrested 965 individuals, including 83 children and 74 women. The report states that 976 individuals were documented as being killed under torture in 2018, including 951 individuals who died due to torture at the hands of Syrian Regime forces, and nine in detention centers of factions of the Armed Opposition, while one woman died due to torture at the hands of ISIS. The report also outlines the most significant violations against medical personnel by the parties to the conflict, through acts of killing of medical personnel and targeting of medical facilities in 2018, documenting the deaths of 53 medical personnel and 108 attacks on medical points and facilities. The Syrian-Russian alliance was responsible for the majority of these violations, killing at least 38 medical personnel and carrying out 85 attacks on medical facilities and clinics. In addition, the report states that 24 media workers were killed in 2018, with 63 percent of this total killed by Syrian Regime forces and their Russian allies. The report also documents six attacks in which chemical weapons were deployed in 2018, in Idlib and Damascus Suburbs governorates, all by the Syrian regime. Meanwhile, cluster munitions were deployed in 13 attacks, with seven of these carried out by Syrian Regime forces, and the remaining six by Russian forces. According to the report, Incendiary weapons were used in 28 attacks on Syrian territory last year, with 11 of these attacks carried out by Syrian Regime forces, and 14 by Russian forces, while the remaining three attacks in this category were launched by International Coalition forces. The report also notes that at least 3,601 barrel bombs were dropped by Syrian Regime forces in 2018. As the report details, 2018 was another year of massive waves of forced displacement, with hundreds of thousands of people forced to leave their homes and land by military operations launched by the parties to the conflict, especially the Syrian-Russian forces, which were by far the main parties responsible for the displacements. The report states that nearly 670 thousand people were subjected to forced displacement in 2018, including 134,000 who were forcibly displaced as a result of agreements and truces which contravene international humanitarian law. The report stresses that the UN Security Council must take additional steps following the adoption of Resolution 2254, which states unequivocally that all parties should: “… immediately cease any attacks against civilians and civilian objects as such…”. Also, the report states that the Security Council should refer the Syrian case to the International Criminal Court and hold all perpetrators accountable, including the Russian regime whose involvement in war crimes has been proven. The report calls on the Security Council to ensure the security and safety of millions of dispossessed Syrian refugees, especially women and children, who have been displaced to countries worldwide, and to ensure their safety from arrest, torture or enforced disappearance if they choose to return to areas controlled by the Syrian regime. The report also recommends that the relevant United Nations agencies make greater efforts to provide humanitarian and food aid and medical assistance in the areas where fighting has ceased, and to camps of internally displaced persons, and to follow up with the States that had pledged to make necessary contributions. The report emphasizes that the OHCHR should submit a report to the Human Rights Council and other organs of the United Nations on the incidents mentioned in this report since these attacks were perpetrated by the parties to the conflict. Moreover, the report calls upon the international envoy to Syria to condemn the perpetrators of the crimes, including massacres, and those who were primarily responsible for dooming the de-escalation agreements to failure, and to redirect the peace process to its natural course after Russia’s attempts to distort it and to place the Constitutional Commission prior to the transitional government. The report calls on the international community to take steps at the national and regional levels to form alliances to support the Syrian people, to protect them from the daily killing, and to lift the siege, as well as to increase support for relief efforts. The report further calls for the implementation of the “Responsibility to Protect” (R2P) norm, after all political channels through the Arab League’s plan and then Mr. Kofi Annan’s plan were exhausted, proving as fruitless as the Cessation of Hostilities statements and Astana agreements that followed. Therefore, steps should be taken under Chapter VII of the United Nations Charter, and the norm of the “Responsibility to Protect”, which was established by the United Nations General Assembly, should be implemented. In the current situation, the Security Council is still hindering the protection of civilians in Syria. The report demands the Syrian regime end its indiscriminate shelling and targeting of residential areas, hospitals, schools and markets, stop its torture that caused the death of thousands of Syrian citizens in detention centers, reveal the fate of some 82,000 Syrian citizens arrested by the security services after concealing their fate to date, and comply with UN Security Council resolutions and customary humanitarian law. The report stresses that the Russian regime should launch investigations into the incidents included in this report, make the findings of these investigations public for the Syrian people, and hold the perpetrators involved accountable. Also, the Russian regime should compensate all the damaged centers and facilities, rebuild and rehabilitate them, and compensate all the victims’ families, who were killed by the current Russian regime, as well as compensating all the wounded. The report further adds that the Russian regime, as a guarantor party in the Astana talks, should take steps to stop the wrecking of de-escalation agreements, and apply pressure on the Syrian regime in order to end all indiscriminate attacks, and should begin making progress with respect to the detainees’ issue by revealing the fates of 82,000 forcibly disappeared persons by the Syrian regime. The report calls on the international coalition forces to unequivocally acknowledge that some of their bombardment operations have resulted in the killing of innocent civilians. The report calls on international coalition forces to launch serious investigations and take speedy steps to compensate and apologize to the victims and others who were affected. Lastly, the report calls on the states supporting the SDF to apply pressure on these forces in order to compel them to cease all of their violations in all the areas and towns under their control, and urges these states to cease all forms of support, including weapon and otherwise.